The medicinal product is comprised only of the active substance, see section 6.1. Induction and maintenance of general anaesthesia in adults and children. Premedication should be selected according to the need of the individual patient, and at the discretion of the anaesthesiologist. The concentration of sevoflurane being delivered from a vaporizer during anaesthesia should be known. This may be accomplished by using a vaporizer calibrated specifically for Sevoflurane. Dosage should be individualised and titrated to the desired effect according to the patient's age and clinical status. A short acting barbiturate or other intravenous induction agent may be administered followed by inhalation of sevoflurane. Induction with sevoflurane may be achieved by inhalation of 0.5-1.0% sevoflurane in oxygen (O2) with or without nitrous oxide (N2O), increasing by increments of 0.5-1.0% sevoflurane, to a maximum of 8% in adults and children until the required depth of anaesthesia is achieved. In adults inspired concentrations of up to 5% sevoflurane usually produce surgical anaesthesia in less than two minutes. In children, inspired concentrations of up to 7% sevoflurane usually produce surgical anaesthesia in less than two minutes. Surgical levels of anaesthesia may be maintained by inhalation of 0.5-3% sevoflurane in O2 with or without concomitant use of N2O. * Neonates are full-term gestational age. MAC in premature infants has not been determined. @ In 1 - <3 year old pediatric patients, 60% N20/40% 02 was used. Emergence times are generally short following sevoflurane anesthesia. Therefore, patients may require post-operative pain relief earlier. Refer to Table 1 for MAC values for paediatric patients according to age when used in oxygen with or without concomitant use of nitrous oxide. 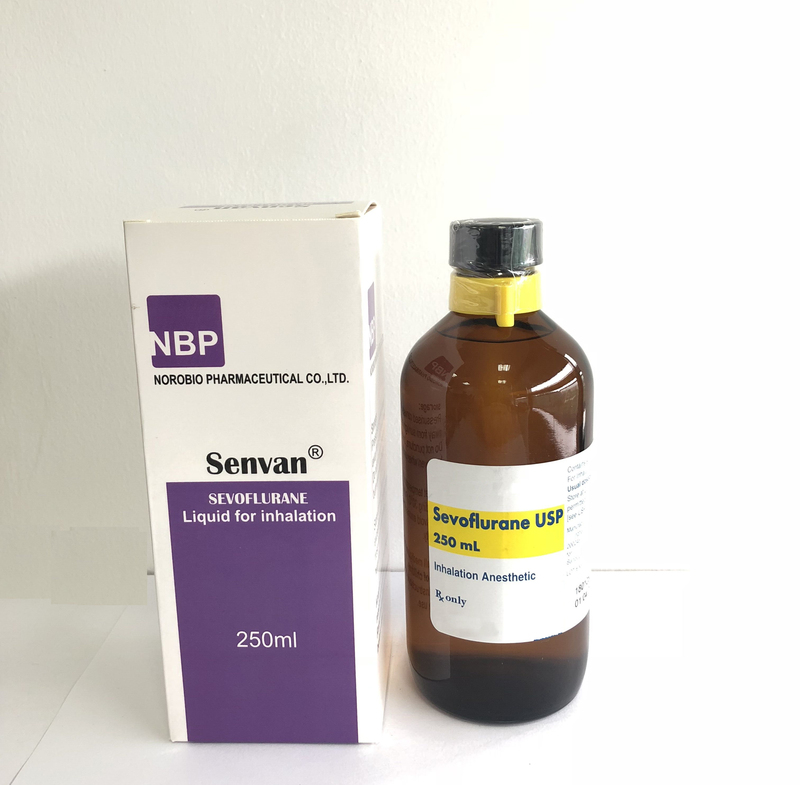 Sevoflurane should not be used in patients with known or suspected hypersensitivity to sevoflurane or to other halogenated anaesthetics (e. g. history of liver function disorder, fever or leucocytosis of unknown cause after anesthesia with one of these agents). Sevoflurane should not be used in patients with a history of confirmed hepatitis due to a halogenated inhalational anesthetic or a history of unexplained moderate to severe hepatic dysfunction with jaundice, fever and eosinophilia after anaesthesia with sevoflurane. Sevoflurane should not be used in patients with known or suspected genetic susceptibility to malignant hyperthermia. Sevoflurane is contraindicated in patients in whom general anesthesia is contraindicated. The concentration of sevoflurane being delivered from a vaporizer must be known exactly. As volatile anaesthetics differ in their physical properties, only vaporizers specifically calibrated for sevoflurane must be used. The administration of general anaesthesia must be individua, , , , , li, zed based on the patient's response. Hypotension and respiratory depression increase as anaesthesia is deepened. During maintenance of anaesthesia, increasing the sevoflurane concentration results in dose-dependent decreases in blood pressure. An excessive reduction in blood pressure may be related to depth of anesthesia and in such instances may be corrected by decreasing the inspired sevoflurane concentration. Due to sevoflurane's insolubility in blood, hemodynamic changes may occur more rapidly than with some other volatile anaesthetics. Recovery from general anaesthesia should be assessed carefully before patients are discharged from the post-anaesthesia care unit. Emergence is generally rapid following sevoflurane anaesthesia; therefore, patients may require early postoperative pain relief. Although recovery of consciousness following sevoflurane administration generally occurs within minutes, the impact on intellectual function for two or three days following anaesthesia has not been studied. As with other anaesthetics, small changes in moods may persist for several days following administration (see section 4.7).